International Harvester & Farmall salvage yards in the Midwest. We suggest you call on Saturdays to make sure we are open. We pick up tractors etc. and are some times forced to close for the day. We are located just a little off the beaten path, but well worth the drive. The Shop is located about 85 miles South of St. Louis off of Hwy 67. The address is 1347 Madison 426, Fredericktown, MO 63645. But please keep in mind that we receive many complaints from those that try to find us with a GPS. They do not always get you right to us. They will get you to the area, feel free to call or use these directions to get right to the salvage yard. From the NORTH. When traveling down Hwy 67. 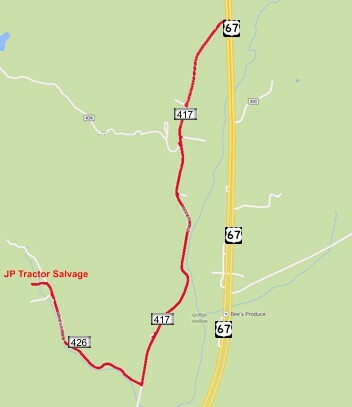 We are about 10 miles SOUTH of Fredericktown. Do NOT get off at the Fredericktown Exit (which intersects with Hwy 72). Continue south. You will drive through a little community called Cherokee Pass (which is basically a Mobil Gas Station, a restaurant and our Tractor Sales Lot - stop by and see or running tractors that are for sale -) Just south of Cherokee Pass about 2 miles, start looking on the RIGHT side of the Hwy for a Blue County Rd sign of 417. Turn Right on this old black top road. 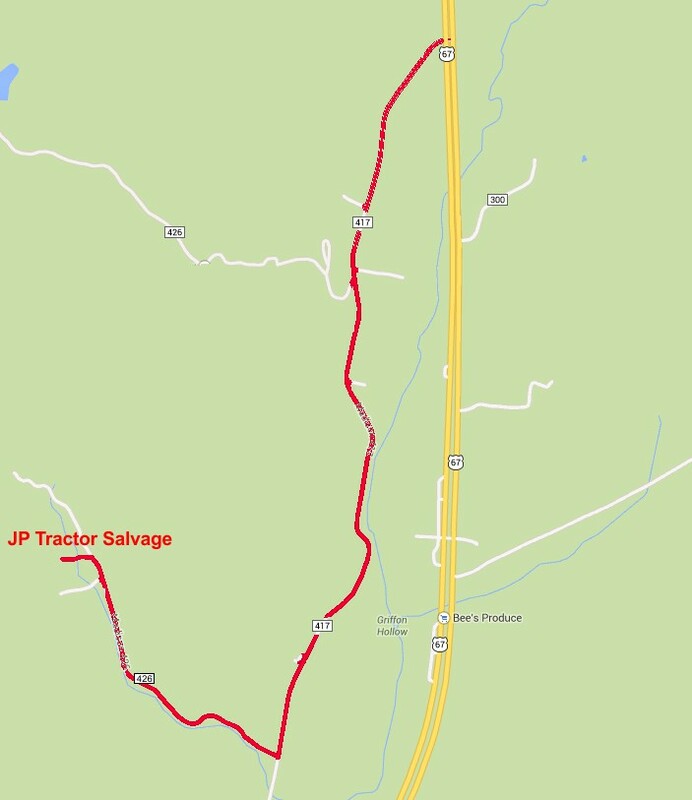 Go about 2 more miles and on the right side of the road you will see a large Red and White JP Tractor Sign pointing down Co. RD 426. Turn on the gravel road - we are down it about a mile, but you can't miss us.